If you only have time for a quick round of golf, the executive course at Colton Golf Club may be the right choice for you. 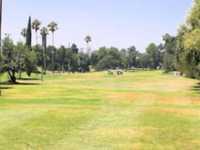 Located in Colton, Ca., this course offers cheap golf in Colton and a great opportunity to work on your short game. You will find Colton in San Bernardino County in the Inland Empire of Southern California right off of Interstate 10. Surprisingly, this 3,108 yard course was deigned by Robert Trent Jones and used to be partially owned by all-time great Sam Snead. Colton Golf Club has 18 holes (par 57) including three par 4s. The course is rated 54.2 with a slope of 82 on Bermuda grass. Although a shorter course, there are plenty of sand traps offering a reasonable golfing challenge. If you want Colton tee times, Colton Golf Club tee times may be reserved online or by calling the course starter. About 43 years ago, Colton Golf Club introduced night golf and with excellent lighting, golfers can enjoy a round of golf after a long day's work. Amenities include a full practice facility, pull cart rental, club rental, pro shop and dining facility. Players appreciate the well-kept greens. For an executive course, Colton Golf Club provides a sufficient challenge for even low handicap players and accuracy is a must for low scores.